"Control Access to Ceph Storage Platform"
Ceph is a free software storage platform designed to present object, block, and store files from a single distributed computer cluster. 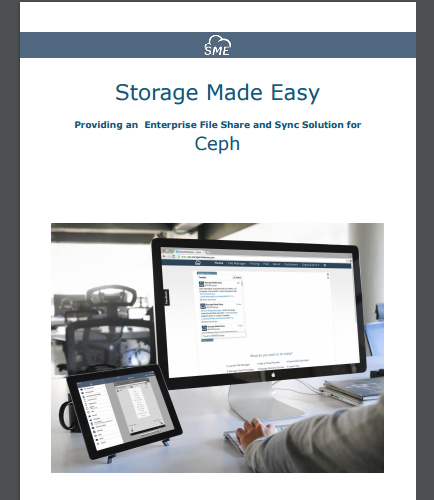 Ceph Object Storage is deployable in a fully scalable highly available architecture. But how can we extend the use of Ceph? Interacting easily with Ceph or share data using common protocols. CIFS Drive Access into Ceph from any desktop. Email integration with Ceph from Outlook/Mac Mail. Unifying Ceph files and private data. Search document content on files stored on Ceph. Enabling key data to be archived to Ceph easily. File sharing policies for Ceph. Enabling sensitive data to be encrypted with a private key prior to being stored on Ceph.